We are all Socrates (Thoughts on the Ancient Greeks, Part 1 of 3). I love Socrates. It is hard not to. 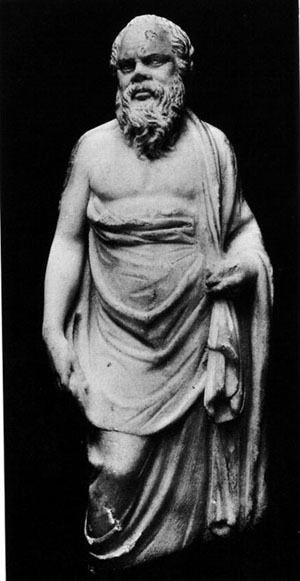 In an age when physical beauty was all-important, Socrates was notoriously unattractive. Big head, bulging eyes, flaring nostrils, pot-belly and dirty feet were his physical attributes. When we say ‘true beauty is on the inside’, Socrates helps us prove the cliche is more than just talk. It was his brain that made the man beautiful. Of course, that beautiful brain would earn Socrates a death sentence. In 399 BC Socrates drank a small cup of hemlock and died in seconds. Infamously, the reason he was put to death was for ‘corrupting’ the youth of Athens, and for introducing new divinities into the polis. But, the real problem was twofold. First, he kept company with men who would become enemies of the Athenian city-state. These men admired and loved Socrates, and so, the philosopher was painted with the brush of disloyal collaboration. Second, and more importantly, he simply asked too many damn questions that ticked off powerful people. The questions Socrates asked were difficult to answer, and his dialogue partners often found themselves in the embarrassing situation of realizing that they were not quite as wise as they thought. Granted, Socrates asked some toughies. He wanted to know: What is virtue? Why should people be good? What is beauty? What is truth? As he walked the streets, he understandably looked for those that society proclaimed as wise, powerful, and virtuous to get his answers. But, as he would frame his broad questions to chosen Athenians, he found (and so did they), that they had little idea how to respond. This embarrassment led to anger; anger led to punishment. I always get excited to introduce (or reintroduce) Socrates to my students in Western Civilization and Comparative Worldviews. In comparison to other great philosophers, his arguments are quite accessible and his hypothetical situations are made for classroom discussions. (I find the Ring of Gyges is the best for heated debate.) But, I realized there is something else that makes Socrates so understandable and easy to empathize with: Every student has known a Socrates. Every student has even been a Socrates themselves. Then they grew out of it. Raising my own children has provided me with a perfect, recognizable analogy for Socrates. At about three, our girls both turned into mini-Socratic thinkers. They grasped the wisdom that the only thing they knew was that they knew nothing. And so, what do little 3 and 4 year olds do? They ask ‘why’? “Why this, and why that”; why everything. “Why do you go to work, daddy”? “Why do you garden, mommy”? “Why are we Americans?” “Why do I need to go to bed”? “Why do people die”? How do parents respond? We usually get frustrated. “Stop asking”! “Why? Because it just is”! “I said so, that’s why”! Or, we buy them off. “Wouldn’t you like some ice cream”? Such responses are based upon more than simple annoyed exhaustion. Parents realize that once three or four consecutive “whys” are thrown our way, we don’t really have an answer anymore. Parental frustration stops being simply about answering questions, and soon becomes self-examination of our lack of wisdom. We stop children dead in their tracks with logical fallacies, and the changing of subjects because we want to keep living within our caves. We find that our children’s questions can make us squirm with discomfort. We are able to buy children off with some frozen treats, or scare them with raised voices. For those in Ancient Athens, Socrates was not so easily disabused of his questions. Ice cream wouldn’t do it. Anger wouldn’t do it. Socrates argued that he was the only thing keeping Athens awake and aware, and would never stop buzzing around them with questions. So they killed him. Athenian democrats silenced a voice that made them feel uncomfortable, frustrated, and frightened. They never had to hear those “why” questions from the old man again. Ah, but fate is fickle. Nemesis, the Greek goddess of divine retribution brought comeuppance. Though Athenians killed him off, a new Socrates was born in Athens everyday.